It is Monday afternoon and the day seems to be a productive one, if not yet quite memorable. As I revise some notes on my desk, Beni Yoshida walks into my office to remind me that the high-energy physics seminar is about to start. I hesitate, somewhat apprehensive of the near-certain frustration of being lost during the first few minutes of a talk in an unfamiliar field. I normally avoid such a situation, but in my email I find John’s forecast for an accessible talk by Daniel Harlow and a title with three words I can cling onto. “Quantum error correction” has driven my curiosity for the last seven years. The remaining acronyms in the title will become much more familiar in the four months to come. Most of you are probably familiar with holograms, these shiny flat films representing a 3D object from essentially any desired angle. I find it quite remarkable how all the information of a 3D object can be printed on an essentially 2D film. True, the colors are not represented as faithfully as in a traditional photograph, but it looks as though we have taken a photograph from every possible angle! The speaker’s main message that day seemed even more provocative than the idea of holography itself. Even if the hologram is broken into pieces, and some of these are lost, we may still use the remaining pieces to recover parts of the 3D image or even the full thing given a sufficiently large portion of the hologram. The 3D object is not only recorded in 2D, it is recorded redundantly! Left to right: Beni Yoshida, Aleksander Kubica, Aidan Chatwin-Davies and Fernando Pastawski discussing holographic codes. Half way through Daniel’s exposition, Beni and I exchange a knowing glance. We recognize a familiar pattern from our latest project. A pattern which has gained the moniker of “cleaning lemma” within the quantum information community which can be thought of as a quantitative analog of reconstructing the 3D image from pieces of the hologram. Daniel makes connections using a language that we are familiar with. Beni and I discuss what we have understood and how to make it more concrete as we stride back through campus. We scribble diagrams on the whiteboard and string words such as tensor, encoder, MERA and negative curvature into our discussion. An image from the web gives us some intuition on the latter. We are onto something. We have a model. It is simple. It is new. It is exciting. 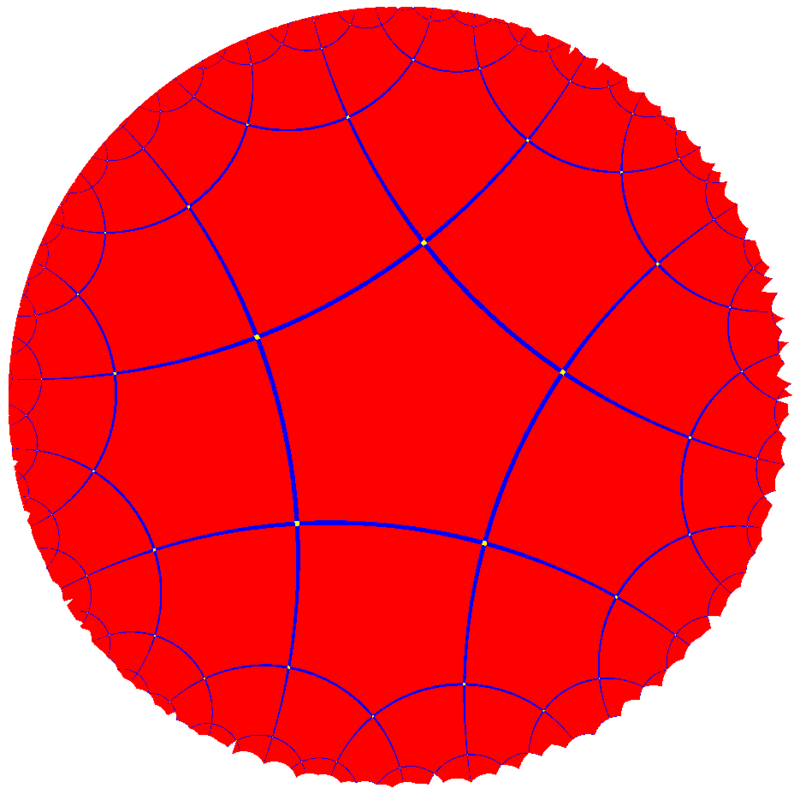 Poincare projection of a regular pentagon tiling of negatively curved space. Food has not come our way so we head to my apartment as we enthusiastically continue our discussion. I can only provide two avocados and some leftover pasta but that is not important, we are sharing the joy of insight. 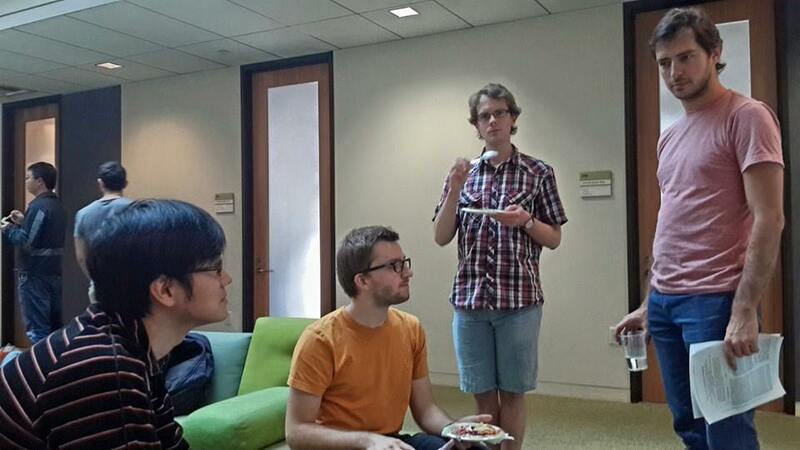 We arrange a meeting with Daniel to present our progress. 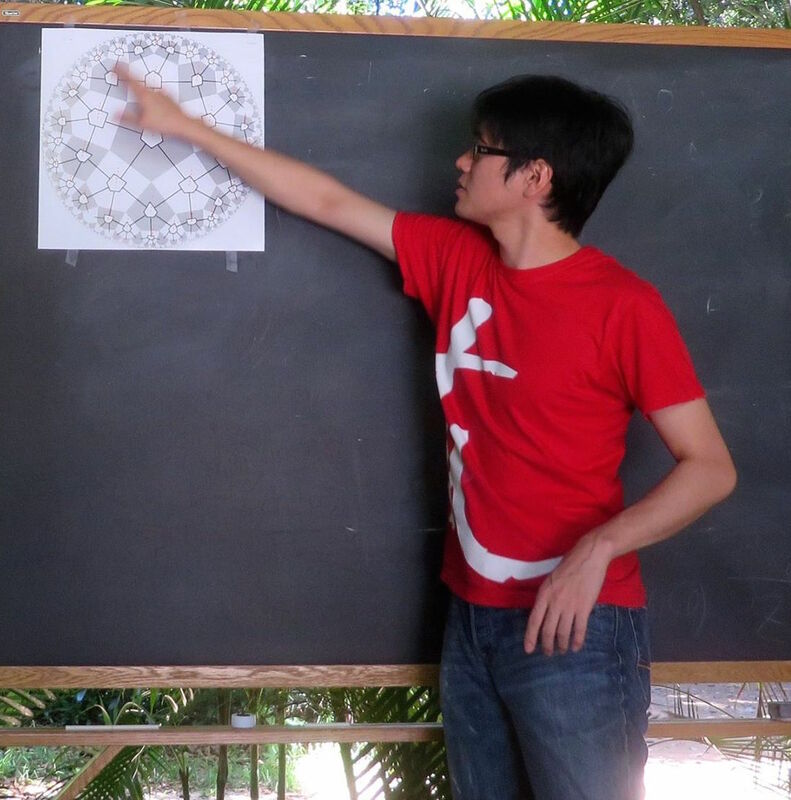 By Wednesday Beni and I introduce the holographic pentagon code at the group meeting. A core for a new project is already there, but we need some help to navigate the high-energy waters. Who better to guide us in such an endeavor than our mentor, John Preskill, who recognized the importance of quantum information in Holography as early as 1999 and has repeatedly proven himself a master of both trades. As Beni puts it, the time for using modern quantum information tools in high-energy physics has come. By this he means quantum error correction and maybe tensor networks. First privately, then more openly, we continue to sharpen and shape our project. Through conferences, Skype calls and emails, we further our discussion and progressively shape ideas. Many speculations mature to conjectures and fall victim to counterexamples. Some stand the test of simulations or are even promoted to theorems by virtue of mathematical proofs. Beni Yoshida presenting our work at a quantum entanglement conference in Puerto Rico. I publicly present the project for the first time at a select quantum information conference in Australia. Two months later, after a particularly intense writing, revising and editing process, the article is almost complete. As we finalize the text and relabel the figures, Daniel and Beni unveil our work to quantum entanglement experts in Puerto Rico. The talks are a hit and it is time to let all our peers read about it. You are invited to do so and Beni will even be serving a reader’s guide in an upcoming post. I’m so happy for witnessing of such striking contribution from the very begining. In those days Fer and me we were discussing INTESTELLAR in every detail as it has so many resemblances with places I’d been myself, as a widow, as a father, as a physicist… Fer was in another galaxy himself, he even got the cooperation of Caltech’s police to cleanly steal a bike…which they did with a giant plier. Then, I received an SMS: “Entiendo AdS/CFT y worm holes en base a código corrector de errores.Emoticono smile”…. Next day, I went to the movies again and open Sean Carroll “From eternity to Here” and Kip Thorne’s “Black Holes & Time Warps, Einstein’s Outrageous Legacy” that I had bought at Caltech bookstore in my previous visit. What was the point left out unfinished by @Maldacena? I hosted his visit at Córdoba University but couldn’t quite remember. Would it really be possible to work out a quantum theory to a worm hole…? Finally…? I asked and asked again, what is the point…? What does John think…? but he was fevering discovery and the answers didn’t come…Only a few weeks later, the mails and SMS brought little more detail…Discrete mathematics…tensor networks, a sort of renormalization group Fer just described a few week ago at Mar del Plata Quantum Optics Conference… a particle distorts the metric of the space-time…entanglement yield a worm hole, Of course, I can somehow grasp that…! Now is for the other colleages physicists to judge…I know how the science game is just too well….objections will come, but who could take out the thrill of those days…what could take away the “joy of insigth”, my MIT master Viktor Weisskopf’s wise term couldn’t describe better a replenished soul, a glorious moment of insight…! Thanks Fernando for letting me being such a privileged witness…! It is a big dream for a person like me to do research in IQIM. I wish that I have a path to go there. Best wishes. ^This. Great peek into a IQIM. I’l try to visit IQIM in May.